In skincare we are always preaching the benefits of a good hyaluronic acid serum. Hyaluronic acid is produced in the skin and depletes as we age. Adding it back into the skin helps moisturize and hydrate the skin. A hyaluronic acid molecule can old 1000 its own weight in water. Imagine how much moisture it adds to the skin? SkinCeuticals has come up with a killer serum that helps takes the work out of adding hyaluronic acid into the skin from the outside. H.A. 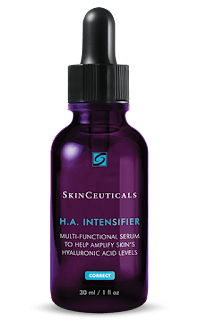 Intensifier is a multi-beneficial corrective serum proven to amplify skin’s hyaluronic acid levels. 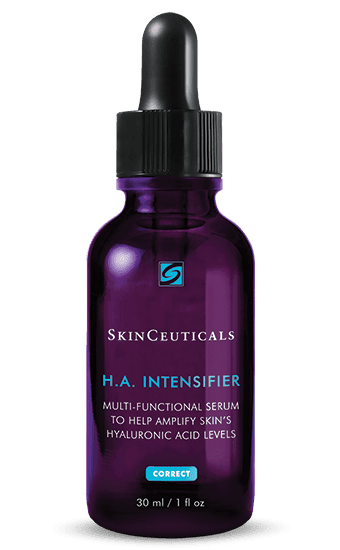 This unique formulation contains a high concentration of pure hyaluronic acid, proxylane™, and botanical extracts of licorice root and purple rice to support skin’s hyaluronic acid levels and deliver surface hydration, helping improve the visible appearance of firmness, smoothness, and facial plumpness. This hyaluronic acid serum may be used as part of a home skincare regimen after dermal fillers; always consult with your physician for individual at-home advice. Reduces the look of crow’s feet, nasolabial folds (parenthesis look around the mouth or laugh lines), and marionette lines (lines from the corners of the mouth down to chin) for smoother, firmer skin. Directions for use: unscrew cap and pull pipette out of bottle. Squeeze the bulb and while squeezing the bulb, put cap back into the bottle and slowly release the bulb to draw up product into pipette. Twice daily, apply 4-6 drops to face. I have not been so surprised by a serum like this in ages. It really goes the distance and does so much more than any other product out there. My skin has never felt so hydrated and moisturized, smoother, firmer and just in glowier in general. I look great lately. I am not bragging, it's just that my skin just looks better than it has in months. If there were one thing I'd recommend lately, it would be this serum. SkinCeuticals H.A. Intensifier retails for $98.00 per (1 fl.oz./30mL). It can be purchased online at www.skinceuticals.com. It can also be purchased in many physician's offices that carry the Skinceuticals line. Like Skinceuticals on Facebook:https://www.facebook.com/SkinCeuticals; Follow Skinceuticals on Twitter:@SkinCeuticals; Follow Skinceuticals on Pinterest:https://www.pinterest.com/skinceuticals/; Follow Skinceuticals on Instagram:https://www.instagram.com/skinceuticals/; Follow Skinceuticals on Google+:https://plus.google.com/+skinceuticals and Subscribe to Skinceuticals on YouTube:https://www.youtube.com/user/skinceuticals.